We Are One Composites - 6 New Rims plus Bar and Stem - April 16, 2019, 10:16 a.m.
ANVL Tilt V3 Flat Pedal Review - April 12, 2019, 8:45 a.m.
Tannus Launches New Tire Inserts For MTB - April 11, 2019, 8:44 a.m.
Tannus Launches New Tire Inserts For MTB - April 10, 2019, 10:16 a.m.
Tannus Launches New Tire Inserts For MTB - April 10, 2019, 9:50 a.m.
Tannus Launches New Tire Inserts For MTB - April 10, 2019, 9:03 a.m. Skeptical. With all that foam right under the outer tread, one would expect a negative effect on traction and the supple feel of a tubeless tire, which is the reason other inserts are based around the rim and exert tension on the sidewall. However, at that price, it's worth a try. 2019 Yeti SB 150 Reviewed - April 5, 2019, 9:44 a.m.
Uncle Dave - Poorly Fitting Helmets and Junk Science - April 5, 2019, 9:16 a.m.
Uncle Dave - Poorly Fitting Helmets and Junk Science - April 4, 2019, 11:23 a.m. 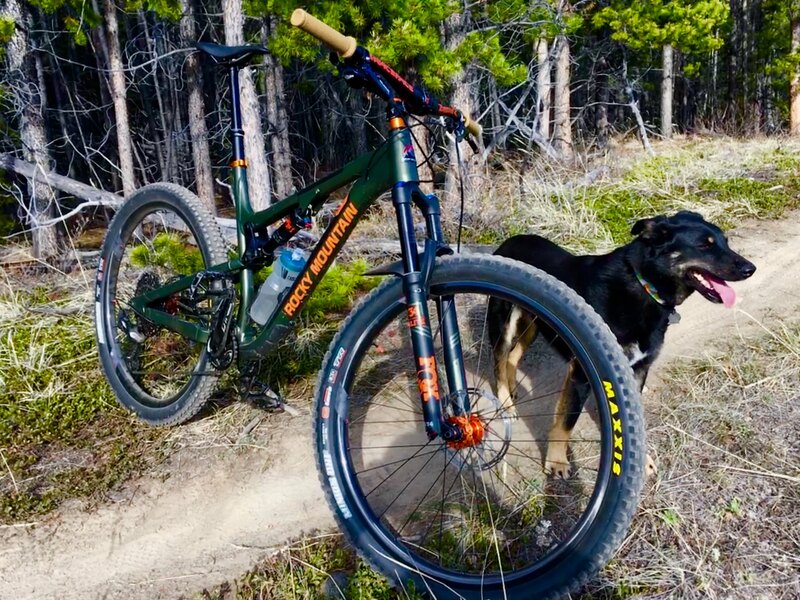 Introducing the Forbidden Bikes Druid - April 3, 2019, 1:47 p.m.
Re: the future of mtb's - April 15, 2019, 9:45 a.m.
Re: long travel wagon wheelers - May 15, 2018, 2:07 p.m. I guess you mean BC edition since this is a long travel thread, but yeah I am riding the new A70 and I think it is a great value. As a super tall dude I wish it had more reach, but it's not bad with a 60mm stem and a bit of rise. I had a 2015 BC edition previously which was a great bike, the new bike is way nicer. Climbs better and more fun/agile than the old bike. I won't comment on the suspension since I went from XFusion -which was great for the price point- to Fox performance elite and of course it's way better in every aspect. Re: crank length - March 27, 2018, 10:41 a.m. I'm 6'6" and tried 180s for a while. I liked the way they rode but the clearance issues were enough that I switched back to 175. 170 just felt too small. 175 is a good compromise for me. Damn! What do you ride at that height? I would think almost all production frames are really too small for you? Re: crank length - March 27, 2018, 10:39 a.m. I'm 6'3.5" and most XL bikes are not big enough for me. We still have a ways to go on reach. I need it longer. Pedal strikes keep me from riding longer cranks but I would not give up 175 mm cranks. I run 185 mm cranks on my monster cross and 180 mm on my other two road bikes. I have 180 mm cranks for touring too. I love the power of the longer leaver and at my height I don't have to worry about closing out my knee angle on the top of the stoke, it's just a non-issue. So it comes down to personal preference. I see everyone here has a full range of preference. Fixed gear I have run 165 mm but prefer 170 mm and I have run 172.5 and 170 mm on the boards. I even have 177.5 mm cranks on one vintage road bike. Re: Light Flexible Knee Protection - June 25, 2017, 6:04 p.m. I have the Dainese trail skins, the first ones. The second ones look like they address my only grip with the originals in that they are more formed to the knee cap. They stay in place. have side protection, move well and aren't irritating, but the fit it a little awkward as they are not cupped enough to fit nicely on the knee. I would recommend them and figure the new ones are the way to go if you can find them. I live in the North so I pretty much have to buy online anyway since local options are extremely limited. Re: Recommendations for a good pair of riding sunglasses? - June 19, 2017, 10:21 p.m. Pretty happy with my riders thorn anti-fog photochromatic glasses. They're a bit big but the anti-fog really works and I can't live without photochromatic lenses anymore. I lost pair of specialized berm's which were photo chromatic last winter on a back country ski trip. I was super bummed. Those were my favorite all time MTB glasses. Re: Budget Dropper Posts? - June 19, 2017, 10:19 p.m.
My partner road a giant dropper on her 2014 trance for three seasons. Never serviced, worked like a charm and sold the bike this spring (the black stanchion one). My friend had the older version with a gold stanchion and it wore out. Some people clamp their post too tight and damage their droppers. I did it with my first X fusion and didn't make the same mistake twice. My partner got a new trance this year with another giant dropper and I hope it holds up as good as the old one. I like the performance of my Xfusion better but it does need more frequent service. Re: Do you buy from CRC? - June 13, 2017, 10:59 p.m. Ordered about $500 of parts and apparel from them on Apr 3rd. Shipped out Apr 4th, delivered in Vancouver Apr 8th. I always choose the Canada Post option. I got charged $9.95 handling and another ~$22 in taxes (which is lower than what it should have been). Fast and cheap, no complaints at all here. I'm at 18 working days now, and nothing has showed up for me. Ordered about $200 worth of Shimano drive train parts. My first order with CRC as well, and it's taking wayyyy longer than I expected. Hopefully better luck on some future orders, or better yet, I hope this order even shows up! Don't start to worry yet. It can often take 3 weeks. Re: (+) 30mm on the bars - am I going to notice? - June 13, 2017, 10:57 p.m.
Is there hard evidence that wider makes you faster? Shouldn't we first ask how tall the rider is and if they have broad shoulders? It seems like everyone is going wider and wider and riding similar bars, but bars should be sized to suit the rider. I'm 6'4" with broad shoulders and am happy with 740mm bars though I do ride some tight trees. I had to put narrower bars on my girlfriends bike because the stock ones are ridiculous for a 5'7" women for trail riding. Re: Trail hoe - June 13, 2017, 10:50 p.m.